a native New Yorker, received a BA in Theatre from SUNY-Purchase. Having worked in theatre around New York, Connecticut and Massachusetts, she now happily resides and design in beautiful Portland. Nicki is pleased to continue her collaboration with Milagro on Contigo Pan y Cebolla. Nicki D’Amico Creciendo a 20 minutos de Manhattan, se graduó de SUNY-Purchase habiendo estudiado teatro. Trabajo en teatros regionales en Nueva York, Connecticut y Massachusetts antes de pasar a pintar murales para varios clientes y después certificarse como masajista terapeuta de Kripalu. Ama a Portland y ha disfrutado mucho su actuación en improvisaciones y en monólogos de comedia. Nicki D’Amico trabajé con el Milagro recientamente en la obra La Muerte Baila. This is Deborah’s second production with Miracle Theatre Group. She has also designs for Profile Theatre, where she will be working on the second half of the Wendy Wasserstein season, The Broadway Rose Theatre Company, and Mt. Hood Community College, where her upcoming project is The 1940’s Radio Hour. Her favorite projects include Lonely Planet, How to Succeed…, Talley’s Folly, Fahrenheit 451, The Lisbon Traviata, and The Case of the Dead Flamingo Dancer. has been a dance instructor at Sandoval's Restaurant in Portland for the last two years. For the last ten years, he has performed with professional dance groups in both the US and in his native state of Vera Cruz. 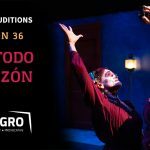 This is his third production with Milagro, having previously performed in En Este Valle de Lágrimas, a Spanish language AIDS/HIV education play and the musical play, El Sueño Americano. Currently, he also performs with the Milagro Bailadores. Berl has his BS in technical theatre and stage management from Portland State University. He is currently the Technical Director at La Salle Catholic College Preparatory, the Scenic Artist at DaVinci Arts Middle School and the man of many technical talents for the Sultanov Russian Ballet Academy. has done extensive technical work, both locally and statewide. In addition to technical work, he has also performed in MTC's Sneaky Fitch and Bodie, an original play produced in the Washington area. comes from Spokane and makes his living as a theatrical technician. He's done community theatre in a number of locations around the Pacific Northwest, including a season at the Oregon Shakespeare Festival. His last acting job was with the Riverfront Players in Spokane playing Theseus in A Midsummer Night's Dream; Gremio in Taming of the Shrew; The Governor in Man of La Mancha; and a pirate in the Pirates of Penzance. He thinks that acting is real "keen", and wishes there was some money to made at it. This is Stephanie’s Miracle Theatre debut. She was most recently seen as Lydia in Portland Center Stage’s production of Pride and Prejudice. Other Portland credits include various roles in JAW/West ’06 and ’05 (PCS), Suzanne in Picasso at the Lapin Agile (Anonymous Theatre), Pompey in Measure for Measure (2Boards), Desdemona in Desdemona: A Play About a Handkerchief (Home Planet Productions), Catherine in The Foreigner (West End Theatre), and Ida in Pools Paradise ( Sylvia’s Dinner Theatre). She holds a BA in Theatre from The University of Virginia. recently received her MA in Fine and Performing Arts from Portland State University. In the last 5 years, she has worked with several local production and theater companies. Some of her past assistant directing and stage management work includes She Stoops to Conquer (PSU), Tom Sawyer, The Boxcar Children (Oregon Children's Theater), and Sexual Perversity in Chicago (Asylum Productions). Jennifer has also worked as a production assistant for Oregon Ballet Theater, and Peak Experience Productions. Her directing credits include, Graceland, The Informer, and Independence. Jennifer also teaches drama to children at the Oregon Children's Theater and Lakewood Theater Company. is a 17 year old junior at Clackamas High School. Originally from Brazil, she is very excited to have this opportunity to work with a Hispanic theater company like the Miracle Theatre. She performed in her first play when she was in the 8th grade and has continued to be involved with music and theater ever since. was last seen in A Piece of My Heart at Portland Women's Theatre and in Sonnet Youth at Stage Four. Other favorite roles include: Sherry in Prom Queens Unchained (Actors Cabaret of Eugene), Greta in Cabaret (Eugene Festival of Musical Theatre) and Wife in The Problem (Pocket Playhouse). She has a Bachelor's in Theatre (minor in Dance) from University of Oregon, and is currently studying acting with Barbara Kite, as well as dance with Mary Hunt and Tracey Durbin. She would like to dedicate this performance as Owl to her mother, Ricky, and Aunt Rusty. recent work includes Sojourn Theatre's The War Project (Drammy award, best ensemble 2006); One Day (citywide tour); American Value ( New York, collaboration with NACL) and Voices from the Edge (Australian tour). Recent teaching residencies include co-directing the Wisdom Bridge Arts Project Summer Youth Camp in Chicago; guest artist/choreographer for The Trojan Women ( Albion College); and work as a teaching artist for ART and Sojourn Theatre. has been an Oregon resident for 3 years. Ms. Davis' theatre activities range from directing to performing. Her Portland directing credits include: Measure for Measure and Much Ado About Nothing for PAE; The Miracle Worker and Knock Knock for the Columbia Theatre and Relatively Speaking for Sylvia's Class Act Dinner Theatre. As an Actor, Ms. Davis has performed as Claire in A Delicate Balance and Bev in Angry Housewives. is a senior Professor of Theater Arts (theory and criticism) at the University of Oregon and has designed theatre buildings as well as scenery throughout America, including the Catlin Gables School Theater and the Lakeridge High School auditorium in concert with John Storrs. Additionally he is the Director for North America of the American Reference Centre for the Study of the British performing Arts, a member of the board of directors for the London Scholar Centre in England, and has co-authored Principles and Styles of Acting. His early professional career was, obviously, in both film and opera, but he has been an academic grind for the past thirty-two years. is excited to be making his Portland acting debut with the Miracle. He has worked extensively in New York City and various regional theaters across the country. Ted lives in McMinnville with his wife Janet and teaches Theater at Linfield College, Willamette University and the University of Portland. Cody Decker is a student lighting designer and stage manager who recently participated in Map of Virtue (Theatre Vertigo), Midsummer Night's Dream (Portland Community College) and A Christmas Carol (Stumptown Stages). Cody is a fan of Grimm's fairy tales and the legends of King Author and Robin Hood. This is their first show with Milagro Theatre, and is excited to be a part of it. received his BFA in painting at the Rhode Island School of Design. He has had his work exhibited at the Woods Gerry Gallery and in the Outside the Bubble Show in Providence, RI. and had a solo show of paintings at the Whit's End gallery in Sarasota, Fla. His most recent exhibition was at the Beam Me Up showing at the New Image Art Gallery in West Hollywood, CA. is delighted to be making her Milagro debut with LTBL! Previous work includes shows with Well Arts Institute, Stumptown Stages, Broadway Rose, BroadArts Theatre, JANE: a theatre company, and Seattle Musical Theatre. She holds a degree in Theatre Arts from Central Washington University and, when not onstage, enjoys working on music and photography. Find out more about her current projects at www.sarahdegrave.com. Many thanks to her wonderfully supportive parents, family, and friends for always encouraging her to be her most fabulous self, onstage and off. was last seen as a dancer in the musical Sugar at Lakewood. Some of her favorite roles include Ginger in Natural Born Castaways, Keely in Keely & Du, the Wicked Witch in The Wizard of Oz and Hermione in Winter's Tale. She is currently a teacher of French and Drama in the Tigard/Tualatin School District and is thrilled to be in her first production at the Miracle. Nacido en Venezuela, apasionado por el fútbol, deporte que lo invita a representar a su país en torneos internacionales. Estudia en la Universidad Metropolitana donde recibe el título de ingeniero civil. En el 2000, se casa con Veronika Núñez para luego establecerse juntos en Portland. Aquí se desempeña como ingeniero y dedica su tiempo libre a apoyar los esfuerzos de OMSI y OCHA. Esta obra constituye su primera aparición en el teatro. Con especial cariño dedica su actuación a su abuelo Donato quien representó un hermosísimo ejemplo de vida y amor. comes from the beautiful island of Guam. It is there that he spent all of his childhood and most of his adolescence. He came triumphantly to the Northwest to attend college. Since his arrival to Portland, he has starred in such shows as La Chunga for Miracle, The Posture Queen and e3's Hot Hot Hamlet. He was last seen in the critically acclaimed, Miracle Mainstage production of Barrio Hollywood. This is Ricardo's first season of touring with Teatro Milagro. has been previously see in in the Ancient Greek Theatre Festival production of Antigone, and he is currently appearing in the Festival's children matinee series Jason and the Golden Fleece. His recent credits include roles at the Ladybug and Playback Theatres and Multnomah Cable Access. John views a growing theatre in an expanding city as providing a vital future civic role. Michael DeMaio (STAGE MANAGER) hails from New York City where he participated in the B.F.A. programs at both Adelphi University and Mary Mount Manhattan College majoring in Theatre Arts. He has been a part of the Portland Oregon theatre community for over fifteen years working primarily as a production stage manager. This is his fourth show with Milagro, having most recently worked on Into the Beautiful North last spring, and is thrilled to be back. Some of his favorite productions he’s stage managed include American Night at Milagro, Falsettos with Live On Stage, and Young Frankenstein at The Lakewood Theatre Company. He is very thrilled to be a part of Swimming While Drowning and would like to thank Francisco, Michel, Blake, the talented creative team, and all the staff at Milagro for a great experience. Michael viene de Nueva York donde participó en el programa de B.F.A. con la concentración en Teatro en la Universidad de Adelphi y Mary Mount Manhattan College. El ha sido parte de la comunidad del teatro aquí en Portland por más de 15 años trabajando principalmente como Productor Ejecutivo, y jefe de foro. Unas de las producciones más recientes y favoritas de Michael son American Night en el teatro de Milagro y Young Frankenstein producida por The Lakewood Theater Company. Esta será su segunda producción con Milagro y está emocionado de ver regresado a este teatro. Michael le gustaría agradecer a, Daniel Jáquez, Nelda Reyes, el equipo creativo, y al elenco más talentoso, y también al equipo por darme una gran experiencia. began his adventure in theatre at the age of 13 as an Assistant Manager after he arrived in Los Angeles via Wisconsin and Minnesota. He continued his theatre career in L.A. working with Actor's alley, West End Playhouse and Theatre/Theatre before relocating to Portland. After three years here and loving it, Dave returns to theatre with Miracle as his first choice. who hails originally from Phoenix, has spent the past three years in Los Angeles. While in Los Angeles, he interned at A Noise Within and worked with the educational theatre group, L.A. Troupe. Other credits include Tom Wingfield in The Glass Menagerie, Lenny in The Homecoming, and Lysander in A Midsummer Night’s Dream. This production of El Grito del Bronx is his Portland debut and he is excited to have it be with Miracle Theatre Group. He offers endless thanks to Tony for believing in him and to his brother and the rest of the Arizona crew for being there. Laura DiMare has a Bachelor's degree in Theater Arts from the University of Costa Rica. She started her professional career with Punto Cero, with whom she won the national award “Best Theater Group”. Along with two colleagues, she formed a theater group, which presented original material in order to address local social issues. Upon moving to Portland, she is thrilled to have joined the Milagro family and have a role in the United States debut of this timeless Costa Rican play. Laura DiMare obtuvo un Bachillerato en Artes Dramáticas en la Universidad de Costa Rica. Comenzó su carrera profesional con Punto Cero, con quienes ganó el premio nacional al mejor grupo de teatro. Junto con dos colegas formó un grupo de teatro cuyo propósito fue el de crear obras originales para abordar temas sociales de interés local. Luego de su llegada a Portland, está muy emocionada de haberse unido a la familia del Teatro Milagro y de tener un papel en el debut en los Estados Unidos de esta gran obra costarricense. nació en Buenos Aires, Argentina y ha estado expuesta a la vida del teatro desde que era niña a través de su mamá y hermana. Vive en Portland desde hace 13 años y estudia en Portland State University. Gabriela siempre tuvo curiosidad por el teatro y finalmente participó en una lectura dramatizada en el primavera del 2011 en Miracle Theatre Group, La casa de los espíritus. Jardin de Sueños es su primera producción y está muy agradecida por esta oportunidad maravillosa de trabajar con un equipo tan energético y talentoso. Gabriela dedica esta obra a sus amigos, sus padres Bibiana y Richard, a sus hermanos Pablo y Facundo, y especialmente a quien la inspiro a estar aquí, su hermana Billi. Gabriela Dipascuale was born in Buenos Aires, Argentina and has been exposed to the life of theatre since she was very young through her mom and sister. She has lived in Portland for 13 years and is currently working on her bachelor’s degree at Portland State University. Gabriela has always been curious about theatre and finally participated in a stage reading the spring of 2011 for Miracle Theatre Group, La casa de los espíritus. Jardin de Sueños is her first production and she is very thankful for this opportunity to work with such a talented and energetic team. Gabriela wants to dedicate this play to all of her friends, her parents Bibiana and Richard, her brothers Pablo and Facundo, and especially to who inspired her to be here on the first place, her sister Billi. has been professionally designing and producing costumes for the past six years, mainly for various dance studios in the Portland metro area, for which she has won “Best Costume Award” for various competitions for the past two years. Valerie also enjoys dancing and teaching dance, as well as spending time with her family. This will be Valerie’s 3rd production with Miracle, having most recently designed costumes for Jardín de Sueños. was born in Uruguay, studied in Chicago and moved to Portland last September. She is a graduate of the Margarita Xingu National School of Theatre in Montevideo. Alicia has been the Artistic Director of Cantijungando and Quengas Theatre companies. This fall she will be returning to Chicago, where she will reside with her husband. is thrilled to be making her Miracle Theater debut. She works full time at the Central Library as well as Triangle Theater. Amelia has performed recently in All in the Timing, The Cherry Orchard, and Joseph and The Amazing Technicolor Dream Coat (Portland State University) and the short film, The Writer's Model (Dianna Turner Productions). Amelia would like to thank her loving fiancé Mark and best friend Nancy for all their love and guidance. is a recent graduate with a Bachelor of Fine Arts from Central Washington University. Of Puerto Rican decent, she is delighted to share her passion for Latino theatre with Teatro Milagro. In addition to acting, Monica is also a dance and fight choreographer, specializing in unarmed, broadsword, and rapier and dagger. Some favorite credits include playing Ariel in The Tempest with Central Theatre Ensemble and originating the lead role in Ramon Esquivel’s Luna. Last season Monica debuted at Milagro in the title role of SUPER ANA! and as an ensemble member in Searching for Aztlán. is approaching twelve years of employment with the company which produces the two Portland Home & Garden shows. Her early work career began in the Mental Health field which in the end, spanned over twenty years starting in residential services for developmentally disabled and mentally ill adults and ended with Vocational Development. Eventually she happened into the position of case manager of a greenhouse workshop program. It was here amongst the scent of the earth, the healing of the herbs, and the cool freshness of a greenhouse that brought to the surface the absence and longing of her Latino roots. MaryHelen was born in San Antonio, Texas and raised in Rockford, Illinois with six siblings. Her parents were determined not to live the lifestyle of a migrant family. That however, came with a dear price as the family became isolated from their natural heritage, their culture, and separated from family still in Texas, still migrating to survive. In the past few years, MaryHelen has reconnected with her family in Texas, and she is re-learning the language she was born speaking. She is light hearted, has a quick wit and a dry, impulsive sense of humor which is clearly derived from her father, now eighty-two years old. She loves George Lopez, has a passion for Mexican music, enjoys creating features and stage sets, organizing fiestas, dance, gardening, cooking and architectural finds. She wants to write several books. It is on this journey of self discovery as a “Latina” that MaryHelen searched for a venue to express herself in a Latino environment that she found the “Miracle”. has long enjoyed absurdity. After portraying Rosencranz in ROSENCRANZ AND GUILDENSTERN ARE DEAD in 1981, the study of language and meaning obsessed him for 3 years, while at Reed College, taking time to see if meaning exists in the real world, he found himself performing Beckett. was last seen as the Virgin Mary in Storefront Theatre's A Passion for Fresh Flowers. She is a graduate of the University of Portland where she appeared in more than a dozen plays. Her performances include Lady Macbeth in Macbeth, Babe in Crimes of the Heart, Roberta in Danny and the Deep Blue Sea, and Maxine in Night of the Iguana. has directed at Milagro Barco sin pescador with Leila Bretón, Fuente Ovejuna, and most recently Ana en el trópico. She is a company member of Northwest Classical Theater Company, as well as the company's resident House Manager. Favorite roles in Portland include: Gretchen in Boeing-Boeing (OTAS Award for Best Supporting Actress), Constance Ledbelly in Good Night Desdemona (Good Morning Juliet); Bianca in Desdemona: A Play About A Handkerchief; Lady MacBeth in MacBeth; and Helsa in The Musical Comedy Murders of 1940. She trained at Wayne State University in Detroit, MI, at New York University's Experimental Theater Wing, and in mask and physical theater with Theater Grotesco in Detroit. She graduated from Portland State University with a B.A. in Theater Arts, Spanish and Arts & Letters. Through PSU she studied at the University of Seville in Spain. She earned a Master's of Education in 2004 from PSU and currently teaches at a local high school. She is also a certified yoga instructor and teaches at a local studio. The highlight of her week is volunteering at the Oregon Humane Society. She is grateful for the unwavering support of her loving husband, Jason. Christy Drogosch anteriormente dirigió por el Milagro Barco sin pescador con Leila Bretón, Fuente Ovejuna, y lo más reciente Ana en el trópico. Ella es miembro de La Compañía del Teatro Cláscio del Nuroeste y sirve como actriz y la gerente de la casa. Sus papeles favoritos incluyen: Gretchen en Boeing-Boeing (OTAS Premio para Mejor Actriz Secundaria), Constance Ledbelly en Good Night Desdemona (Good Morning Juliet); Bianca en Desdemona: A Play About A Handkerchief; Lady MacBeth en MacBeth; y Helsa en The Musical Comedy Murders of 1940. Ella se entretuvo en la Universidad del Estado de Wayne en Detroit, MI, en el Teatro Experimental en la Universidad de Nueva York, y en los artes del teatro físico y la máscara con el Teatro Grotesco en Detroit. Se graduó de la Universidad del Estado de Portland con Bachillerato en los Artes del Teatro, el Español, y los Artes y Letras. Por la Universidad del Estado de Portland estudió en la Universidad de Sevilla en España. Se graduó de PSU con Maestro de la Educación y actualmente trabaja en una escuela secundaria en Portland. Además es una maestra certificada en Yoga y trabaja en un estudio en Portland. El punto culminante de cada semana para ella es sirve como voluntaria en la Sociedad Humana de Oregón. Ella está muy agradecida por inquebrantable apoyo de su esposo, Jason. was born in Salvador, Brazil. Emile joined her first amateur theatre group at age 9, after encountering a poster in the local library. Most recently, Emile played Lady in Red in a production of Ntozake Shange’s 1975 choreopoem/play for colored girls who considered suicide / when the rainbow is enuf at Lewis & Clark College, where she studied English Literature. Emile has practiced improv, and appeared in a series of community based productions throughout her childhood and adolescence with local Brazilian theatre groups and in Costa Rica. is thrilled to be making his Milagro debut! Since moving back to Portland from New York where he trained at Fordham University, Noah’s been seen working with Post5 Theatre (Romeo & Juliet), Compass Repertory Theatre (‘Tis Pity She’s a Whore), Action/Adventure Theatre (Fall of The House Seasons 5 & 6), and The Working Theatre Collective. Noah wishes to thank his family for such love and support and the cast and crew for all the hard work and dedication! is enjoying her first time working with a Portland theatre and is excited to learn about how a show comes together. Previous theatre experience includes playing a Shark girl in the Gallery Theater production of West Side Story. She loves watching Broadway productions and getting lost in great musicals like Singing in the Rain and Chicago. Joel Patrick Durham is a Portland based director and actor. Most recently Joel wrote and directed Nesting: Vacancy a serialized horror/thriller, which performed at the Shoebox Theatre last October. Previously he appeared as Luciana/Dromio in The Bomb-itty of Errors (Post-5 Theatre) and has toured three shows with Oregon Children’s Theatre, performing for youths all over Oregon. Joel is a proud member of the 13/14 Third Rail Mentorship Program.